We live in interesting times. But to some people all times are interesting. As the Zen Monk said, Every day is a good day. Therefore every day is also an interesting day, but this week we have been consumed by an avalanche of serious dislocations – changes of far reaching political significance. There is a potential revolution in the air, and it seems incredible that it has been put in motion by three Old Etonians, two of them members of the Bullingdon Club. How has this happened?. Clearly it’s not deliberate – a thought out policy or a strategy. It’s more likely a failure of strategy, in fact a colossal blunder, leading to an escalating series of blunders. Some people appear on the scene when they should disappear, coming forward when they should withdraw; not knowing how to maintain tranquil silence, not knowing how to watch that fullness does not reach overflowing, they sometimes go awry by impetuosity, sometimes go awry by conceit. Heedless of subtle indications appearing, failing to carefully examine changes when they occur, day by day they proceed along the path to misfortune, regret and humiliation, so that the path of humanity is lost. Who went awry by impetuosity? David Cameron, when he promised his rebels a referendum. Who went awry from conceit? Boris Johnson, whose ambition knows no bounds. These two ‘leaders’ have now put the UK in danger of a recession and the breakup of the kingdom. It would be a farce if it wasn’t a tragedy for everyone who is not rich – ie 99% of the people who will pay in one way or another for the failure of leadership shown by these tin pot politicians. 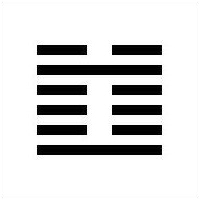 The I Ching is an ancient Chinese classic that deals with changes. It’s title translates as The Classic of Changes, and it is a tool that assists in the observation and understanding of the anatomy of events. 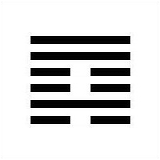 Hexagram 59- Dispersion– deals with a situation like the one we are living through, when things are falling apart. It’s about a time of disorganisation and disorder, when things separate or scatter. What does it tell us to do so that we can survive through the forthcoming chaos? The hexagram itself represents the elements wind over water. Water represents the deepest part of our body and therefore of our selves, but water also represents danger, as anyone who has lived through a flood or tsunami knows. The wind is something that penetrates into all places and also disperses things to all points of the compass. The strong and deep emotions and thoughts that have been unleashed by the Referendum are all now dispersing widely, reaching more and more people. These emotions are both positive and negative – anger, resentment and selfishness are there, but so is compassion, openness and affection. Which set of emotions will be given power to thrive? In Nazi Germany it was anger and resentment that were encouraged, and look at the disaster that led to. In our day it must be positive emotions of love and companionship, otherwise we are all lost. We need a leader with wisdom and foresight to help us get out of this chaos and find a stable footing. In a time of revolution, anything becomes possible. New thoughts can be taken up, new ideas tried. We all must know by now that something is wrong with our society and it needs to be fixed. Surely the Leave vote was in part a protest by millions of people against austerity, against a lack of good jobs, against overpriced housing, insufficient school places and fears for the future of the NHS. At heart this is a protest against a ruling elite that is completely indifferent to their lives, that literally couldn’t care less. If we want peace, if we want good lives, and if we want some happiness then it should be clear what is needed. If it’s broken, we’d better fix it or it’s going to get worse. We have to do what is needed, and that means reversing the gross inequality in our society. It is not difficult to do, it just takes political will, but it will be difficult to get everyone on board the project. People will have to be persuaded that this is the only thing that can really save us. And that is why we need a leader who can make that case. You are caught in a very vigorous tide of events, but there is no misfortune. Big changes bring no trouble, because the flow of change is a natural (group) event and not the result of personal (selfish) effort. A miscalculation provides a chance to go forward. In misunderstanding a situation you experience a small loss. This loss creates an opportunity to recalculate and ultimately succeed. You are rescued from a dangerous situation. A setback becomes an opportunity to establish security and success. 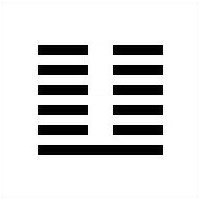 The changes that the I Ching talks about in Hex 59 are not ones we personally make, but huge changes that come at us swiftly and surprisingly and with overwhelming shape and scale – just like a flood. We know that in a flood many of our possessions will be either swept away or rendered unsalvageable. We know there is no option but to go out and get new ones. But first we have to clean up the mess that the flood has left behind. Well, our flood has passed and if we open our eyes we can see the devastation it has left behind. It is now our task to mend things. What is the best way to resolve dispersal? We find ourselves at a crossroads. To go along the way we have been going- economically and politically – will continue to create inequality and foster anger, resentment and hatred. In this way we will make society worse and encourage all the negative emotions that have been stirred up. The other way is to change how we order our society, to encourage greater equality and to lose the selfishness that has driven our economy and politics. If we do this then the positive emotions that we want to encourage – the fostering of community and solidarity – can lead us to a better society. It is a matter of acknowledging the truth of the situation, that austerity and capitalism have created an alienated, unhappy and unhealthy population, and the only answer has to be to stop creating more inequality. crisis that will soon engulf us. anew in every instant; another world is possible.